Within the halls of the Connecticut State Capitol is the remnant of an oak tree containing pieces of artillery fire that were supposedly from the Civil War battle of Chickamauga. There is evidence, however, that suggests it was not from Chickamauga but, instead, may have been fabricated to “fool” viewers. Is the relic the result of deception? If the tree is authentic, then it is an impressive artifact from a bloody Civil War battle. If forged, then what is its story? The Battle of Chickamauga was fought in September of 1863 and pitted the Union Army of the Cumberland under William Rosecrans against Braxton Bragg and the Confederate Army of the Tennessee. Braggs’s aim was to maneuver Rosecrans out of the city of Chattanooga, Tennessee, which was a vital transport and communication center for the Confederacy. Author James McPherson claimed, “Chattanooga had great strategic value, for the only railroads linking the eastern and western parts of the Confederacy converged there in the gap carved through the Cumberland by the Tennessee River. Having already cut the Confederacy in two by the capture of Vicksburg, Union forces could slice up the eastern portion by penetrating into Georgia via Chattanooga.” Bragg decided to face the Union army on the banks of Chickamauga Creek. The attack began on the 19th with a powerful assault against the left side of the Union line. There, commanded by General George H. Thomas, the Union army faced harsh opposition as Confederate troops poured in on them. Multiple Union regiments were sent north to help Thomas because if the line was flanked, Northern resistance in Tennessee would be eradicated. Ultimately, the first day ended in a standstill and Bragg did not break the Union line as he intended. On the morning of the 20th, Bragg orchestrated another attempt to break the Union left. Again, the Union troops held on. At midday, however, the unthinkable happened. Believing that General Thomas needed more reinforcements, division commander Wood prematurely dropped out of his position and a major hole opened up in the Union battle line. The Confederacy decided to take advantage of the opportunity. Union regiments soon broke away and retreated north towards the safety of Chattanooga. Even Rosecrans realized that it was impossible to have any success and he decided to retreat towards Chattanooga as well. 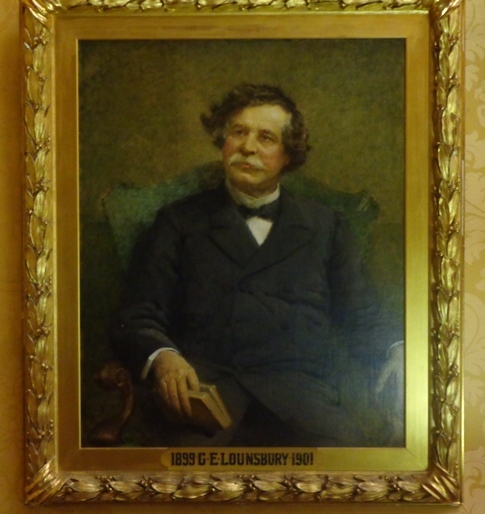 According to a May 26, 1899, Hartford Courant article, Edgar Smith Yergason gave the Connecticut State Capitol a Chickamauga tree placed in the North corridor of the building under the care of Governor George E. Lounsbury. Mr. Yergason wrote a letter explaining, “It is my desire that this war relic be placed where it may be seen by the public, and I take great pleasure in tendering it to the state of Connecticut. To be placed with other elements in the state capitol.” This seemingly special oak tree was roughly seven feet tall. According to this same article, the tree had multiple cannon balls in its trunk. The tree stayed where it was for many decades. However, in the 1960s it was removed for fear that the cannon balls contained live gunpowder residue. The tree was declared a hazard to the public and taken to Ft. Devins, Massachusetts. According to a 1969 article in the Hartford Courant, the tree was then cleared of gunpowder and returned to its original place in the capitol. That the tree had gunpowder residue might confirm its presence at the battlefield of Chickamauga: In fact, there was an article in the New York Times dated June 14, 1898, that wrote of thunderstorms in the Chickamauga battlefield and the fear that many of the remaining trees could explode. 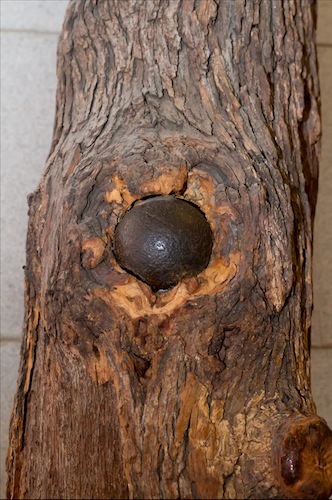 The possible danger surrounding other trees that were laying around the Chickamauga battlefield and the fact the Mr. Yergason stated that the tree was “Alive” (with cannonballs) are strong points for its authenticity. Can one conclude that this mystery tree is indeed a powerful reminder of the blood that was spilled at Chickamauga? Is this the end of the story? Additional aspects to the mystery suggest that the tree is not as authentic as it appears. The first clue is the time at which Yergason and other people purchased Civil War trunks. The tree that was in Yergason’s possession was not the only specimen that existed. 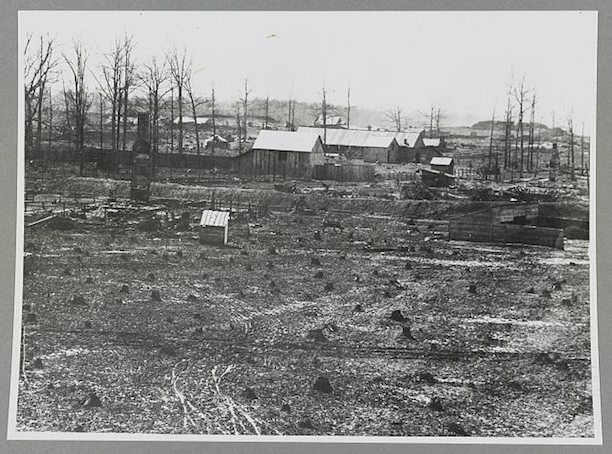 In fact, Yergason had a few more tree trunks that were allegedly from an area of the Chickamauga battlefield called “Bloody Pond.” He claimed that the trunk he gave away was in his possession for an extended period of time, indicating that he might have had it between the middle of the 1880s to the early 1890s. There were also reports of a pair of Chickamauga trunks in Kingston, New York, that were used as decorations for a local Grand Army of the Republic Hall. These particular trees were recounted in an article from the New York Times on May 10, 1892. Furthermore, there was another prominent Connecticut citizen that was also an avid Civil War collector. A. E. Brooks also owned a pair of Chickamauga tree trunks. In the cases of both Mr. Yergason and Mr. Brooks, the trees were shipped to them. The years in which the men acquired the trees are important because there was yet another significant article, this one from the Providence Journal and published in the New York Times on May 5, 1895, that reported the existence of a hoax surrounding Civil War tree trunks. The hoax, discovered by Walter H. Durfee, purported that a pair of farmers in Chattanooga admitted to faking Chickamauga trees. Essentially, they put cannon balls in the trees to create the appearance that the trees were in a Civil War battle. The farmers also claimed that they had a “prosperous business” and had many trees in their possession. The timing of the Chickamauga tree hoax fits within the timeline of other Chickamauga trees, except for the relic of Mr. Brooks. So, it is probable that E. S. Yergason’s tree could have been manufactured. It is not just the timeline, however, but other elements that are important pieces to this puzzle. One of these elements is a tool called an auger. The American Heritage dictionary defined an auger as “a tool for boring holes into wood.” This was an item that the men in Chattanooga admitted using. They drilled holes, stuck the cannon balls in and made it appear that the wood had grown over the piece. 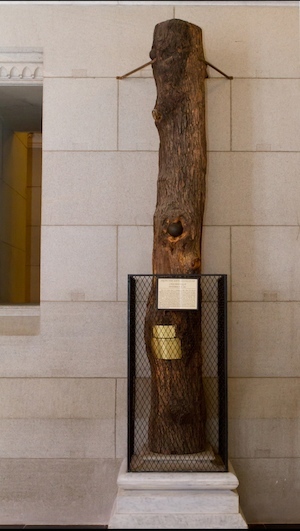 Dean Nelson, director of The Museum of Connecticut History in Hartford believes that the tree in the capitol showed evidence of the use of that tool. Nelson also believes that there were other trees formerly in The Museum of Connecticut History that also had evidence of auger use. Walter H. Durfee, the man who was responsible for the discovery of the hoax, believed he saw a drilled hole after one of the cannon balls fell out of his tree. Yet another issue regarding the Chickamauga tree’s authenticity is the subject of converging fire, or fire from all different directions. That suggests that the trajectory of artillery and musket fire could come to a single point from all different angles. As stated previously, the fighting at Snodgrass Hill was linear. It was one line continually facing another and it was also in an area where artillery was practically useless. The Chickamauga tree of A. E. Brooks showed evidence of converging fire. However, Dean Nelson believes that there was no converging fire at the Battle of Chickamauga. Therefore, this means that the trees of Mr. Yergason and Mr. Brooks do not show evidence of being at Snodgrass Hill and the only conclusion is that the tree trunks were produced. In another interesting twist, it is probable that the cannon balls in the tree now are not even the same balls from when Yergason donated the item. In an article from the Hartford Courant dated August 5, 1969, the paper claimed that “the state’s carpenter will be called on to replace the evidence of the devastating battle. The tree trunk will take some direct hits, but this time from a carpenters hammer instead of a Union or Rebel cannon.” The article established that the cannon balls at the time of the tree’s donation were not put back. Ultimately, the relic may have been manufactured when it was initially donated and then the original cannon balls also replaced. There are many clues that indicate the Chickamauga tree at the Connecticut State Capitol is not quite what it appears. Continuing research into the trunk might shed additional light as to whether it is really from Chickamauga or a fake. Either way, we can appreciate it for its interesting history. After all, how many capitol buildings can claim evidence of an historical conspiracy? Christopher Frank lives in Northford, Connecticut, graduated from North Branford High School in 2009, Holy Apostles College and Seminary in 2013 with a bachelor of arts in the social sciences, and is currently pursuing a master of arts in history at Central Connecticut State University. His interest in history is the Napoleonic Era and he is a major fan of the works of J. R. R. Tolkien. Arnold, James R. Chickamauga 1863: The River of Death. London: Osprey, 1992. “Army Experts to Remove Cannon Balls from Capitol.” Hartford Courant. July 24, 1969. Morse, Charles F. J. “‘Cannon Ball Tree’ Quits Capitol.” Hartford Courant. July 25, 1969. “Capitol Cannon Balls ‘Alive.’” Hartford Courant. July 23, 1969. “Historic Tree Is Home Again.” Hartford Courant. August 5, 1969. “Lightning at Chickamauga; Thunderbolts Strike Trees and Cause Fears of Powder Explosion.” The New York Times. June 14, 1898. “Relic of Chickamauga: The Gift of Veteran E.S. Yergason to the State. Bullet-Riddled Tree to Be Placed in the Capital.” Hartford Courant. May 26, 1899, sec. ProQuest - Hartford Courant Historical Newspaper database - Available through iCONN.org. Journal, The Providence. “Two Guileless Chattanooga Farmers: They Sell Bogus Chickamauga Relics to Northern Visitors.” New York Times. May 5, 1895. 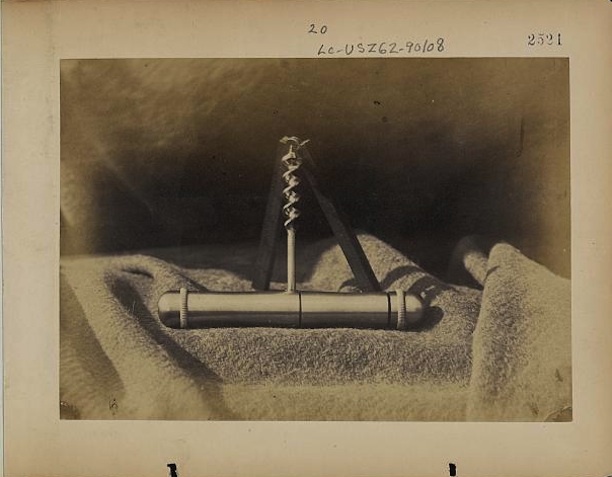 “War Relics from Chickamauga.” New York Times. May 10, 1892.